Today I’m here to offer you another version of my favorite black bean chilaquiles. The original recipe gives you a riot of textures and bright flavors: the salty crunch of tortilla chips, lime, feta, chunky salsa, cilantro, a drizzle of crema, maybe even a few crisp radishes, all supported by a spicy puree of black beans, smoky chipotles, and garlic. A bowl of those chilaquiles is one of my favorite foods. But some days call for something a little simpler, a little healthier, and a heck of a lot less work. On those days, lately, I’ve been making this version of the recipe instead. The backbone of the dish, the spicy black bean puree, is unchanged from the earlier recipe. But once the beans are ready, I don’t fuss with the little bowls of assorted toppings or with baking or frying the tortillas into chips. Instead, I just dunk warm corn tortillas into the beans and then fold them into quarters right on our plates, topping them with a scoop of salsa, avocado, a handful of toasted pine nuts, and a dusting of cilantro. With a salad alongside, dinner is served. That said, of course you could always go halfsies and use tortillas with as many toppings as you can rustle up. Or you can apply this simpler approach to a bowl of chips if you like the crunch, although I’ve been appreciating the yielding texture of the dunked tortillas. And it’s never crazy to put a fried egg on your dinner, of course. Black Bean Enfrijoladas: Chop a big onion and brown it in a pot over medium-high heat. When the onion gets a few shades past golden brown, mix in 5 minced garlic cloves and 1-2 tsp. chipotle puree*. Notice that your kitchen is starting to smell great. Add 4 cups cooked or canned black beans (if you cooked the beans yourself, add enough of the liquid to nearly cover the beans, or as much as you have. If the beans are canned, drain and rinse them). Add enough additional water to nearly cover the beans. Add 1/2 to 1 1/2 tsp. salt (depending on whether the the beans are already salted) and simmer for about 20 minutes to blend the flavors. Puree with an immersion blender (or simply mash the beans) and add more salt to taste. Like all bean preparations, this one depends on salt, so if the flavor doesn’t make your eyes roll back with happiness, you probably need a little more—but add it a little at a time and give the beans time to absorb it before each taste-test. While the beans are cooking, chop some cilantro and toast a handful of two of pine nuts or pepitas in a dry pan over medium heat, stirring constantly (remove them from the pan as soon as they’re nicely toasted or they’ll continue cooking and burn). When the beans are ready, wrap a stack of corn tortillas in a damp tea towel and microwave them for a minute to warm them up. Submerge the warmed tortillas in the bean mixture one at a time, using tongs to fold each one into quarters (while still in the pot of beans). If you are serving them right away, move 2-3 folded tortillas to each plate and send them to the table; otherwise you can fold the tortillas, arrange them slightly overlapping in an ovensafe serving dish, and keep them warm in a low oven. Serve 2-3 folded tortillas per person garnished with salsa, cilantro, avocado slices, and the toasted pepitas or pine nuts. Provide lime wedges on the side. *Chipotle puree: Buy a can of chipotle chiles in adobo sauce, scrape the entire contents into your blender, and whizz to a puree. Keep it in a jar in your fridge. Use it on everything. You’re welcome. This entry was posted in Beans and Other Legumes, Mexican Flavors, Vegan or Would-Be-Just-As-Good-Vegan and tagged black beans, chipotles, corn tortillas, garlic, Mexican recipes, onions, vegan recipes, vegetarian recipes on February 21, 2013 by emmycooks. Oh wow. Those tortillas look amazing, but your chipotle tip is genius. I always avoid buying chipotles because it seems wasteful to buy a whole can just for one chile in a recipe. But now I know better! That’s actually my best kitchen tip, period. I’m glad you appreciate it. :) And I’m glad that you can start buying chipotles in adobo now because they’re so so good! How do you fold the tortilla into quarters in the beans??? They appear rolled in the photo but folding them makes me think of flipping them over in a half circle and then corner to corner. Looks wonderful! I love Mexican anytime, anywhere, anyway. Never tasted anything I didn’t like. Sounds delicious and would be perfect for the cold weather we are having. Yum yum yum! 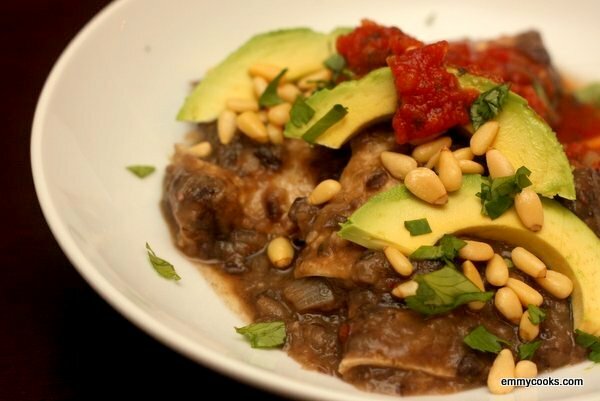 I love black beans and have been looking for a good meatless version of this dish. Deeeelish! Wow — this looks totally yummy! Perfect for this stormy weekend. When I open a can of chipotles I freeze the extra chipotles individually in a muffin tin, and then pop them into a freezer bag or container once they’re solid. Then I can pull one out whenever I need it. That’s strange — I can’t “like” this post. I’ve been experimenting more with Mexican food lately, and there are some good ideas in here to try. Unfortunately we don’t have as large a selection of the ingredients around here. Good post! Yummmm, this is an awesome idea. The “dunked” tortillas seem like a nice trade-up from tortilla chips; even without the crunch, the pureed black beans must add so much flavor! My mouth was watering just reading the recipe… I consider myself one of chilaquiles’ biggest fans, so I’m always happy to learn about nice variations! Chipotle puree…. chipotle puree…. chipotle puree…. Must go to store. Emmy! I made this last night and it was a show-stopper here at our house. It has also totally informed my weekend plans: breakfast burritos this morning with leftover beans, eggs, and more chipotle sauce! Also, for what it’s worth, we don’t have a microwave and I couldn’t steam up my tortillas to make them more flexible – they broke a little bit in the folding, still tasted amazing though! Yum. Huevos! Yes. Can’t wait to try it. Absolutely love it! and chipotle purée is pure magic, no?